ab22378 is not expected to work in standard western blots, under denaturing conditions, or in IHC on formalin-fixed tissue. To our knowledge, ab22378 will only stain frozen sections or fresh cells, and will only immunoprecipitate the antigen from cell lysates in mild detergents such as NP40 or Triton-X100. Our Abpromise guarantee covers the use of ab22378 in the following tested applications. Immunohistochemistry (Frozen sections) - Anti-CD8 antibody [YTS169.4] (ab22378)Coleman et al PLoS Genet. 2014 May 8;10(5):e1004321. doi: 10.1371/journal.pgen.1004321. eCollection 2014 May. Fig S3. 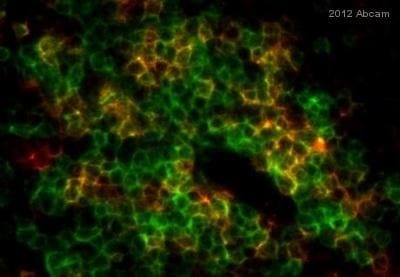 IHC-Fr labeling for CD8-positive T-Cells, as indicated by red immunofluorescence (ab22378 at a 1/50 dilution). Yellow arrows designate positive cells. *** = p≤0.001. Frozen sections from mouse skin (8 µm thick) were post-fixed in cold acetone at −20°C for 10 minutes then air dried at room temperature for 20 minutes. All sections were then washed three times with 0.05% PBS-Tween (PBST); then nonspecific antibody binding was blocked using 10% normal goat serum in PBST at room temperature for 30 minutes. Sections were then incubated overnight at 4°C with primary antibody. Primary antibody incubation was followed by three washes with PBST before addition of the secondary antibodies, which were incubated on the sections for 2 hours at room temperature. Nuclei were counterstained with DAPI (200 ng/mL) for 10 minutes at room temperature. Finally, sections were rinsed with PBST, dehydrated through sequential alcohol washes and then cleared in xylene. Slides were mounted with DPX mounting medium. 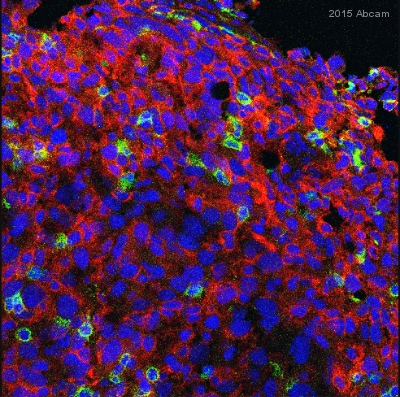 Normal mouse (CBA) spleen cells (red cell lysed) double stained with ab22378 (0.3 µg/mL, detected with Alexa Fluor® 488-conjugated monoclonal mouse anti-rat antibody) and an APC conjugated hamster anti-mouse CD3 antibody. ab22378 stains an expected subpopulation of CD8 alpha positive T cells. 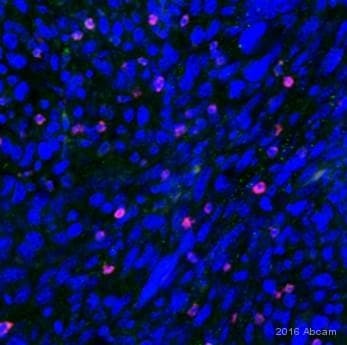 Overlay histogram showing mouse spleen cells (C57BL/6) stained with ab22378 (red line). The cells were incubated in 1x PBS / 10% normal goat serum / 0.3M glycine to block non-specific protein-protein interactions. The cells were then incubated with the antibody (ab22378, 0.1μg/1x106 cells) for 30 min at 4ºC. The secondary antibody used was Alexa Fluor® 488 goat anti-rat IgG (H&L) (ab150157) at 1/2000 dilution for 30 min at 4ºC. Isotype control antibody (black line) was rat IgG2b [RTK4530] (ab18541, 2μg/1x106 cells) used under the same conditions. ab22378 staining CD8 in murine bone marrow cells by ICC/IF (immunocytochemistry/immunofluorescence). Cells were formaldehyde fixed prior to blocking in 2% BSA for 30 minutes at 20°C. The primary antibody (1/200) was incubated with the sample for 9 hours at 4°C. An undiluted Alexa Fluor® 555-conjugated goat anti-rat polyclonal was used as the secondary. The nuclei were stained with DAPI. ab22378 staining CD8 in mouse spleen tissue sections by IHC-Fr (Frozen sections). Tissue samples were fixed with acetone and blocked with 5% serum for 2 hours at 25°C. The sample was incubated with primary antibody (1/250 in PBS-Tween) at 4°C for 12 hours. An Alexa Fluor® 594-conjugated Goat polyclonal to rat IgG (1/250) was used as secondary antibody. Nuclei were stained with DAPI. Publishing research using ab22378? Please let us know so that we can cite the reference in this datasheet. One doubt: some of this antibody only react with mouse, and you suggested human tissue. Is it correct? There may be some antibodies where I might have suggested the human tissues or cells. I apologize for this. I have included the positive control information irrespective of species so similar mouse tissues sections can used as positive control. Actually the positive control information for each antibody is present on the datasheet; please check the datasheet. Alternatively, we always follow human protein Atlas database (http://www.proteinatlas.org/index.php). The second option is, searching positive control for other antibodies in catalogue against same target; the cell line or tissue sections tested with those antibodies could also be used as positive control. The third place to search for is literature. and negative control for the antibodies below. She will do ICC and IHC-P assays. The positive control for ab36392 is IL2 activatedcultured NK cells. ab51312; Thymus tissue sections, human pancreas tissue sections. I am a professor of Shandong university and I bought two antibodies a few days ago, which were anti-CD8 antibody [YTS169.4] (ab22378) and anti-CD86 antibody [GL-1] (ab119857). I want to use these two antibodies to detect the expression of CD8 and CD 86 in B16 melanoma, which was grown in the armpit of mice. The detection method is IHC-Fr, but there is no dilution radio for IHC-Fr http://www.iciba.com/detection in the instruction. Can you tell me the dilution radio of these two antibodies? I will like to thank you for giving me the help and I am look forward to your reply. We suggest to optimise the working concentration according to the sample. Initially, you could try using 1:250 for ab22378 and 2ug/ml for ab119857. I would like to know if this antibody recognize both homodimer of CD8 receptor (alpha and beta) or only one of them. Unfortunately we have not mapped this clone and we currently do not have any empirical data to indicate which region of CD8 is recognized. However, online papers mentioning the clone indicate it recognizes a band of about 32kDa in lysates. This would suggest that it recognizes CD8b but we have no paper conclusively stating such. We also have not tested this antibody in WB and it is therefore not covered by our guarantee. I am sorry that I do not have a more conclusive answer for your question on this occasion and hope it is nevertheless helpful. Please do not hesitate to contact me again with any further questions. Thank you for your inquiry ab85792. Unfortunately, we are not able to release the immunogen sequence for this particular antibody as it is proprietary information. We aim to provide as much information as possible to our customers, so I am sorry that this has not been possible on this occasion. However, I have done a blast search and due to sequence homology ab85792 is expected to cross-react with two species with Pongo pygmaeus and Gorilla gorilla gorilla - but not with mouse. We have two alternative antibodies in our catalogue which cross-react with mouse CD8 i.e ab22378 and ab34282. I would suggest that your customers should take a look at the datasheets to see if they suit their need. Should you have any further questions, please do not hesitate to contact us.